Now that spring is here, we’re more than ready for warm weather and sunshine. With temperatures reaching the 70s and no more chills in the forecast, it seems like the warm weather is here to stay. That’s perfectly fine with us – we’ve hung our coats and sweaters up for the season and are ready for shorts and flip flops. If you need us, we’ll be on the beach soaking up some sun! There’s still time to plan your spring vacation to Destin, Florida. Spring doesn’t just happen during the month of March – April and May count, too! Our lodging partners Southern Vacation Rentals still have some availability left for vacation rentals in Destin during spring. A Playa Amore 932A at Miramar Beach Villas is one of our favorite places to stay in Destin. 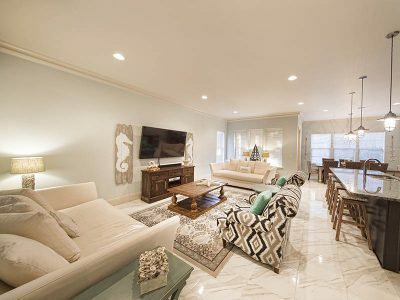 This four-bedroom townhome is ideal for groups of 11, so bring the whole family when you come down to Destin. There’s a good reason we can’t get enough of A Playa Amore 932A. Jaw-droppingly luxurious with high-end upgrades, no detail was spared when this townhome was designed. White marble floors, pale blue walls, and upscale furnishings complete the coastal charm found here. The open floor plan allows the conversation to flow smoothly through the living room to the kitchen are you prepare meals. A large granite breakfast bar, custom cabinetry, and stainless steel appliances make up the stunning kitchen. Accented by sparkling light fixtures and a turquoise tiled backsplash, we’re sure you’ll love preparing meals here. 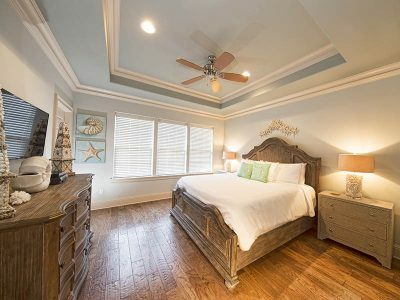 The master suite is certainly our favorite room with real hardwood floors, a tray ceiling, and coastal decorations throughout. Just take a look at that bathroom! Even the walk-in shower is marble. In addition, a private backyard patio is also yours to enjoy, with ample seating and a private gas grill. You’ll have access to a private beach boardwalk when you vacation here, as well as a community pool. A Playa Amore 932A is located in the heart of Destin, so you’re closer than ever to incredible shopping, dining, and more. How will you be spending your spring break vacation in Destin, Florida? Let us know on our Facebook page. We’ll see you at the beach!